One of the biggest retailers of outdoor gear is REI. REI originally formed back in 1938 and quickly became a go-to source for gear and apparel aimed at outdoor living. They are a household name in the outdoor industry and sell items for nearly every major outdoor activity as well as casual apparel, workout gear, and yoga products. Despite now having a fairly diverse selection of gear, REI stays true to its roots by focusing heavily on camping and hiking equipment. What some may not know is that REI not only sells major brand names, but they also have their own label. Much of the REI brand gear is competitively priced, often offering a slightly less expensive product than major brands but without sacrificing quality. Most of what REI’s label produces is very well made and performs just as you’d expect a more expensive brand too. On occasion, their products even outperform competing brands. 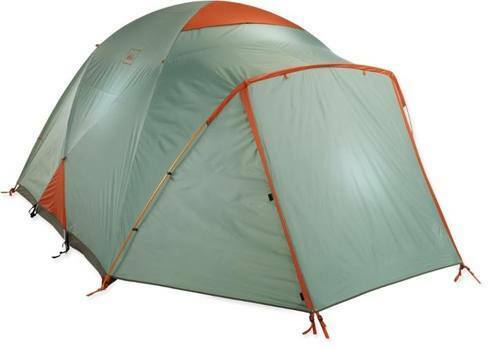 REI-brand tents are just one example of how the brand produces some excellent gear. If you’re looking to purchase a big tent (i.e. a larger occupant capacity shelter) you’ll quickly realize just how expensive these shelters get. Often these large tents are used for car camping, meaning setting up a campsite right by a car. They are often favored by families (a great family tent) or friends that are into casual camping settings, not serious hikers looking for high tech gear for thru-hiking. However, if you plan on using your tent often it is important to really invest in a model that is going to last. REI Co-op makes an amazing 6 person capacity tent called the Base Camp 6 Tent. The Base Camp 6 is a solid 4-star model that is designed for a comfortable, frustration-free camping experience for groups or even long-term camping for couples. The combination of price, quality, advantages, and relatively few downsides, makes the Base Camp 6 a superb choice as a large shelter for under $450 (For the latest prices and discounts, check here). If you’re searching for a new tent for your family or friends, the Base Camp 6 should on your list to research. 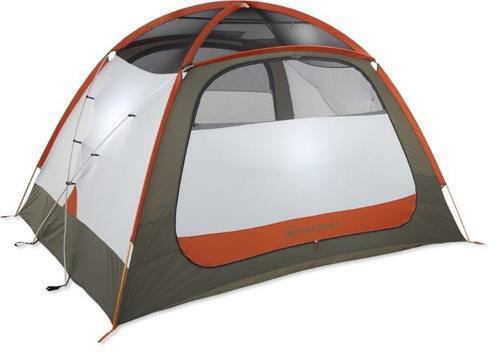 This tent has been designed very well and has some great advantages compared to other models. Final Take: Is the Base Camp 6 Worth it? REI, not surprisingly, put a lot of effort into the design and construction of the Base Camp 6. Some brands fail to make their large capacity tents sturdy enough to handle heavy use, but REI made sure this model could stand the test of time. Here is a rundown of the basics you need to know if you’re considering purchasing the Base Camp 6 tent. Total Floor Area – 86.8 sq. ft.
As you can see, REI really put in solid effort to make sure that the Base Camp 6 was made to handle rough country while still being a stress-free, enjoyable home away from home. The main reasons for the Base Camp 6 being so popular can be summed up in the following three factors. This tent is not at all short on room. The geodesic design really makes the tent feel open while the ceiling height is comfortable for even fairly tall individuals. Essentially this tent gives you an 8′ by 10′ protected room. The vestibules are also quite roomy, with even the smaller one giving over 2.5′ of space. The roomy shape of the tent is still very streamlined to ensure wind flows right over it as well. The Base Camp 6 is a very sturdy, stable tent. It is freestanding in design which means you can set it up anywhere without having to rely on stakes for support (although do so at your own risk if high winds are a reality). The tent does use stakes for the vestibules, but many find they still work well in rocky soil. Overall the tent is incredibly weather-resistant with a competent rain fly. It is surprisingly warm, which is why REI labels this model as a 3 but potentially 4 season tent. Chances are you can use this tent in early winter or even throughout winter, so long as you aren’t experienced extreme colds or very heavy snowfall. That being said, the roof vents and ability to roll up the sides for additional ventilation is great for warm weather camping as well. Aside from the amazing size of this model, the Base Camp 6 is enjoyable to stay in for extended periods for other reasons as well. The dual vestibules make it easy to store gear or even set up as a mini outdoor kitchen while it’s raining. The double doors and their wide design also make it easy for occupants to come and go without disrupting other campers, particularly at night when you’d rather not have to crawl across someone sleeping. The numerous pockets and gear loops are great for keeping everything tidy for longer trips as well. There are two downsides most commonly cited from customers. REI does clearly state that the Base Camp does not come with a gear loft or footprint tarp, so this disadvantage isn’t false advertising but rather just a disappointment. Considering that the price of the tent is over $400 (For the latest prices and discounts, check here), many customers wished that REI would have at least included a loft, though both additions would have been appreciated. It would be fairly far-fetched to assume that a tent designed to shelter so many people would be anything close to lightweight. That being said, compared to other similar-sized tents the Base Camp 6 is still a bit on the heavy side. Packed in its case you will need to carry just about 20lbs for just the shelter alone. This really limits this model to a car camping tent only, especially since when packed there is no simple way of divvying up weight amongst a few people. While the Base Camp 6 tent might not be without some flaws, overall it is an excellent large shelter when needing space for 4+ people and their gear. It is sturdy and stable enough to handle 3 season camping on a regular basis. The roominess and ceiling height makes it feel far from claustrophobic if you’re camping out for a weekend or more at a time. As the name suggests, this tent really is roomy enough to perform as a base camp out in the backcountry. 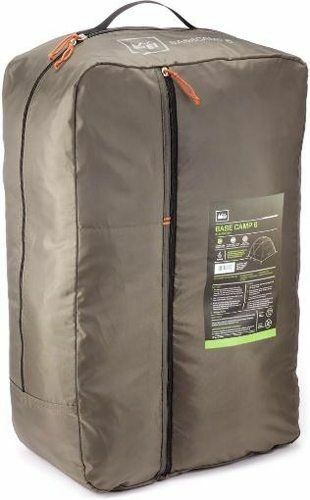 Bottom Line: If you need a big tent that isn’t going to break the bank but also will last for many years, the Base Camp 6 is a very good choice to consider. If interested, be sure to check out REI here for the latest Co-Op deals. REI Kingdom 6: I’ve reviewed this thoroughly in the past, consistently a best seller. North Face Kaiju 6: Similarly the Kaiju 6 is another option worth checking out and has some additional storage options in contrast to the Base Camp tent.